Scott Barnett is a partner and intellectual property attorney who focuses his practice on strategic counseling and guidance regarding intellectual property matters. 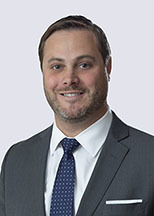 Scott has extensive experience litigating complex intellectual property cases before Federal Courts, the Patent and Trademark Office, and the International Trade Commission. In addition to his litigation practice, Scott counsels clients on domestic and international patent procurement strategies, and prosecutes patents in the software, electrical, and mechanical arts. Cellspin Soft, Inc. v. Under Armour, Inc. (N.D. Cal. 2017). Successfully defended Under Armour in patent infringement suit involving wearable technology. The district court found the asserted patent to be invalid as directed to a patent-ineligible abstract idea. Stern v. Globus Medical, Inc., 1-16-cv-00091 (D. Del. 2016). Successfully represented defendant Globus Medical in a patent infringement suit involving spinal implant technology. Court disposed of Plaintiff’s primary theory of infringement on a motion for summary judgment. Reckitt Benckiser Pharms., Inc. v. Watson Labs. (D. Del. 2016). Secured favorable bench trial ruling against generic manufacturers in ANDA litigations relating to Indivior’s leading opioid dependence treatment product, Suboxone® Film. Wundaformer, LLC v. Flex Studios, Inc. (Fed. Cir. 2016). Argued patent appeal at the Federal Circuit on claim construction issue. Innovative Automation LLC v. Baker & Taylor, LLC (E.D. Tex. 2015). Represented defendant Baker & Taylor in a patent infringement suit involving e-reader technology. Case settled upon favorable terms to client. Media Rights Techs., Inc. v. Capital One Financial Corporation (Fed. Cir. 2015). Represented defendant Capital One in successful appeal before Federal Circuit in a patent infringement suit involving digital rights management technology. Wundaformer, LLC v. Flex Studios, Inc. (S.D.N.Y. 2015). Represented Defendant in patent infringement suit involving Pilates exercise equipment. Plaintiﬀ stipulated to non-infringement following claim construction ruling in client’s favor. VideoShare LLC v Viddler Inc. (D. Del. 2013). Represented Defendant in patent infringement suit involving streaming video. Case settled upon favorable terms to client. LA-CO Indus., Inc. v. Techniweld USA, LLC (N.D. Ill. 2014). Represented Defendant in trade dress infringement suit involving design for handheld temperature indicator crayons. The case was quickly and eﬃciently settled on favorable terms to client. Media Rights Techs., Inc. v. Capital One Financial Corporation (E.D. VA 2013). Represented Defendant in patent infringement suit involving digital rights management technology. Case was dismissed via motion for judgment on the pleadings based on the Court’s ﬁnding that all asserted claims were invalid as indeﬁnite. AIA Eng’g Ltd. v. Magotteaux Int’l S/A (Fed. Cir. 2011). Represented declaratory judgment defendant Magotteaux in successful appeal involving ceramic wear components used for grinding, crushing, and conveying abrasive materials. Obtained a decision reversing the district court’s summary judgment of invalidity of Magotteaux’s reissue patent based on recapture. Meyer Intellectual Props. Ltd. v. Bodum, Inc. (Fed. Cir. 2012). Represented Defendant in successful appeal before U.S. Court of Appeals for the Federal Circuit involving manual milk frothers. Obtained favorable decision reversing or vacating each of the seven issues on appeal, including summary judgments of infringement, a ﬁnding of willful infringement, and an award of attorney fees. AIA Eng’g Ltd. v. Magotteaux Int’l S/A (M.D. Tenn. 2012). Represented patentee Magotteaux in jury trial involving ceramic wear component technology. Jury upheld validity of the patent, found that patent was willfully infringed and awarded client enhanced damages, attorneys’ fees, and costs. AIA Eng’g Ltd. v. Magotteaux Int’l S/A (Fed. Cir. 2013). Successfully represented appellee Magotteaux in appeal contesting trial court’s determinations that (i) asserted patent was willfully infringed warranting enhanced damages, (ii) asserted patent was not invalid based upon alleged prior public use, and (iii) asserted patent was not invalid as obvious. Trial court’s verdict was aﬃrmed in its entirety. Principal drafter of Petitions of Inter Partes Review in IPR Nos. 16-1615, 16-1616, 16-1617, and 16-1783 involving artiﬁcial Christmas tree technology (decisions pending on appeal). Principal drafter of Petition for Covered Business Method Review in CBM No. 16-14 involving digital exit-intent technology (case settled on favorable terms for our client after ﬁling the Petition for CBM). Successfully represented patent owner in Ex Parte Reexam No. 90/012,717 involving ceramic wear component technology (validity of all challenged claims upheld). Successfully represented trademark applicant in appeal before the Trademark Trial and Appeal Board overturning Examiner’s descriptiveness refusal with regard to trademark application serial no. 85552395 for the mark LASGANA CUPCAKE. Successfully represented patent owner / complainant in ITC investigation No. 337-TA-644, In the Matter of Certain Composite Wear Components and Products Containing Same, resulting in the issuance of an exclusion order, cease and desist order, and attorneys’ fees.